Q: What do composting, no ‘poo washing, and family cloth (reusable toilet paper) all have in common? A: These are all things that used to make me gag or roll my eyes – because ewww, right? But now I don’t even blink an eye when these topics come up. In fact, Matt and I have embraced and implemented some of these things in our own household, and now WE are the weird crunchy ones folks have to hide their eye rolling from. This past week I realized I have hit another milestone in my “crunchy” journey. Composting toilets no longer seem strange/gross/far-fetched. Yes, I actually read about using a composting toilet as a means to creating a more sustainable household, and I thought, “Great point – not enough people do this!” They are easy to construct, no water is wasted, and the resulting “humanure” can be used to fertilize trees and plants. Go ahead and let out a big “ewww,” but THAT is sustainable my friends. 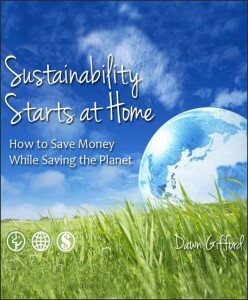 I recently had the privilege of reading the brand new e-book Sustainability Starts at Home by Dawn Gifford. While I have read my share of books on “green” living and creating sustainable habits, this one was a very straightforward, practical, empowering book on the topic. Not only is it a convincing call to action for saving our planet’s resources, but it also gives advice on saving money and simplifying your life in the process. Warning: Gifford doesn’t pussyfoot around the real issues in this book – the book will challenge everything you are currently doing and inspire you to make immediate changes. Want to know why recycling isn’t enough? Did you know there are ways to get the power company to pay you? Want to know how riding your bicycle could change the world? Curious about which appliances are “energy vampires,” sucking the most electricity in your house? Want to do a little experiment to simplify your life that could save you $200-$500 per month? One of the reasons we started this website was to teach people how to become more sustainable by returning to the simple habits and practices our grandparents lived by. We aspire to learn new skills and decrease our reliance on modern culture so that we don’t have to loot WalMart if some sort of tragedy were to strike. You may not want to build a homestead or ride your bike to work every day, but we recommend doing every little bit to live a simpler, more self-sufficient life. Instead of watching TV, fill your hours with reading, learning activities, and other tasks that will save you money, and build your skill set. Learn about sewing, gardening, cheese-making, or raising animals. Or goats, or cows, or ducks. Not only will you have a fresh food source in your back yard, but after feeding your own family, you may also have a little food to sell or barter. Install a wood burning stove, look into renting solar panels, collect rain water, put in a composting toilet, and anything else you can do to use less municipal or regional resources. Our website is a great resource for making these things. You’ll be amazed at how much money you save, how many toxins you’ll eliminate from your household, and how waste is reduced when you make your own. Rely less on packaged foods, even if they are organic. Learn how to make your own crackers, condiments, sauces, candies, noodles, and any other packaged foods you may still be buying. Whenever possible, ride a bike, walk, or use public transportation. If you live in a rural area be sure to make infrequent trips, combining errands. Barter or share whenever possible. Don’t have the stand mixer your recipe calls for? See if you can borrow from a friend. Don’t know how to fix the plumbing problem? Offer to do some mending projects for your friend who knows about plumbing. 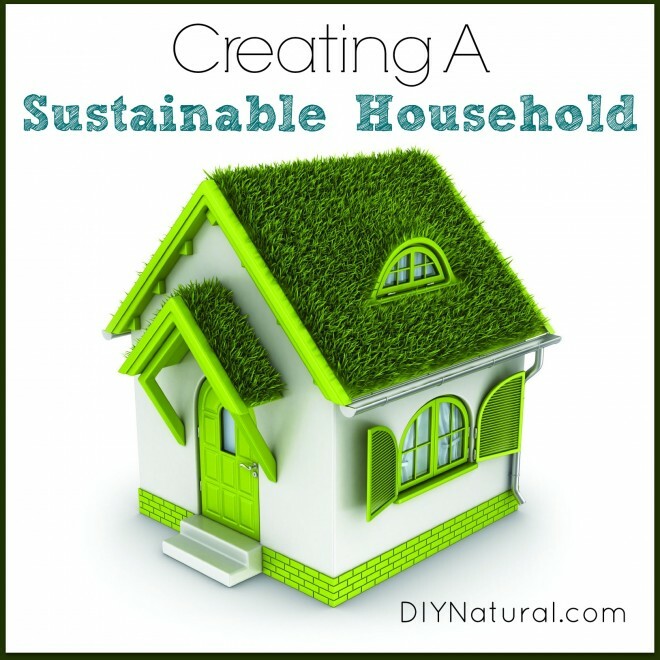 Want more tips on creating a sustainable household? Then I highly recommend checking out the new book Sustainability Starts at Home. This is a meticulously researched book on how simplifying your life can save you thousands of dollars a year and help change the world. Thank you for a great site! I have started making the homemade laundry detergent & I love it! I am slowly working on making all of my cleaning supplies – with 7 people in our household, every little bit we can do to live simply & become a sustainable household certainly helps! Ladies, you have a legitimate point about needing electricity to read the ebooks, but you can charge them with solar. I have a Goal Zero Guide 10 solar charging kit I use to charge all my electronic devices. Also, I can have thousands of books on my ereader BUT carrying around a thousand print books is, in no way possible. These types of books are investments in sustainable living. You can’t grow in sustainable living if you don’t read and implement what you learn – right? You can read books from the library, or borrow from friends, and we hope you do. But this opportunity to get 30 sustainable books at such a low price, is worth sharing with our community. And I do understand the convenience of having 30 books squished into a little tablet. Makes sense. I remember my parents collecting Time-Life How-To books all my life. We had at least 30 of them, from A-Z each detailing how to do something for yourself. I also know we had two sets of encyclopedias in our house which we used for all of our homework and learning. I guess my thought is, if I can stay as simple as possible at the same time informed as possible, then I feel like I’m trying to live a more simple life. Less cluttered. Less dependent on others and on other countries who are making our technology for us. We saw a movie this weekend and it showed what life might be like if the entire “Web/Cloud” finally exploded (albeit over-dramatic), but it did make us think that putting all of our efforts into technology rather than going back to a basic lifestyle, we’re setting ourselves up for a huge crash if we no longer have said technology. And yes, I understand I’m writing this on a computer, hooked to a server, which is hooked to the Internet. Got it. Ha ha! I can still hear my keyboarding instructor howling out the individual letters “a-s-d-f-q-w-e-r-z-x-c-v,” it is a VERY useful skill and one I’m so glad I learned. And yes, I learned it all on a manual typewriter. ACK!!! You made me laugh out loud. Yes, I remember that and my own teacher telling me to “Lift your wrists! Don’t have lazy hands!” all six period. Sigh. And now, I make sure any keyboard I have has a soft, cushioned wrist pad, so as to rest my wrists whilst typing. Ha! Agree. Two worlds to help make this one better. Please Bless that it does. Getting off the grid means using less electricity to fuel your life. Go to used book stores or the local library and read about living better rather than using an electronic book which needs electricity to charge itself and IF we end up in a catastrophe, no one will be wondering where they’re going to plug in their eBook to charge it so they can read about how to take of themselves. I had to chuckle at this offer. If I follow your directive in saving money, I would borrow this book from someone that already has it. It does sound good but how can I get this book without buying 30 books? I don’t do e-books. I’m not computer savy. This is an ebook offer, so if you don’t utilize them you may not be interested. But if you want to buy this book only, you can get it here for $15. Blessings.